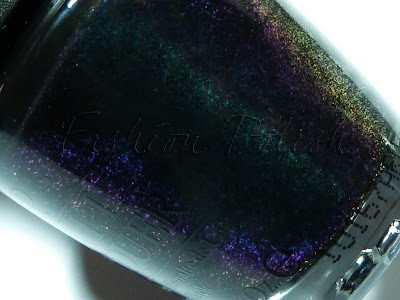 Although I'm sure you're all already familiar with this nail polish from the Go Goth! Halloween set, I though that since I'm wearing it I might as well show it to you. Unripened is a fascinating nail polish in the bottle and in spite of being much more elusive on the nail, it's definitely a must have in my book. 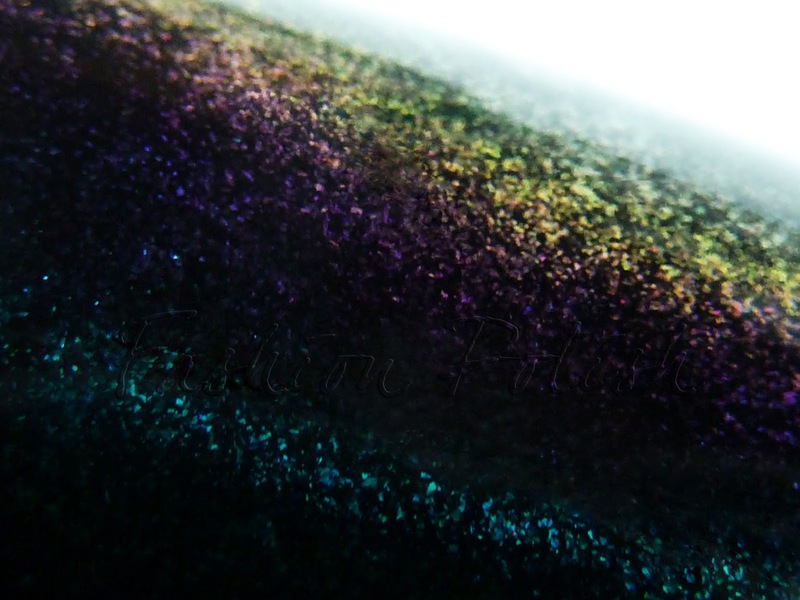 It's a black base shimmer packed with multichome particles going from aqua to blue, blurple, purple and yellow. Opaque in two easy coats (no topcoat here), pretty much Opi's standard, no disappointment here. It's one of those rare nail polishes that truly makes me happy everytime I look at the bottle : instant joy in a solvent! I'm sure you have one of those too and I'd be curious to know which ones, maybe it's your turn to create lemmings, LOL. Wow. This polish looks amazing. I love the shimmer in this polish - it's jumped straight onto my to-buy list! That color is wicked. Too bad that the bottle color doesn't match the nail color, but regardless, it's still awesome! I REALLY love duochrome polishes! And lately I've been in love with OPI's "Not Like The Movies". It's sheer, so you need 3 coats, but the silver/pink duochrome is beautiful! @Hey-Hay Yes, the one on the pic is a big bottle, I got it after buying the mini set, I just had to have it! I believe the Sinful you're referring to is What's Your Name, it's almost an exact dupe being a tad less shimmery but it's definitely a good choice if you can't get yours hands on Unripened. @Lindsay M. B. I hear you about Not Like The Movies. What I usually do with sheer polishes is layer them over a one coater close to their base color, like China Glaze Millenium is this case, it should give you more opacity and since it dries in a flash it's a win-win. Anyway, thanks girls for all yours nice comments as always!!! You inspired me i had to put this color on. its so pretty! i wish my camera would pick up the sparkles like yours! your pictures are so amazinggg!